Fig. 1—The n-value decreases as yield strength increases. Specifying minimum yield strength limits the maximum allowable n-value. Many industries are reducing the weight of their stampings, especially automotive. In addition to weight reduction of the primary stamping, secondary weight reductions occur in stampings that support the force or function of the primary stamping. Reducing the weight of a vehicle body-in-white allows secondary weight reductions in support axles, power transmissions and other areas of the vehicle. 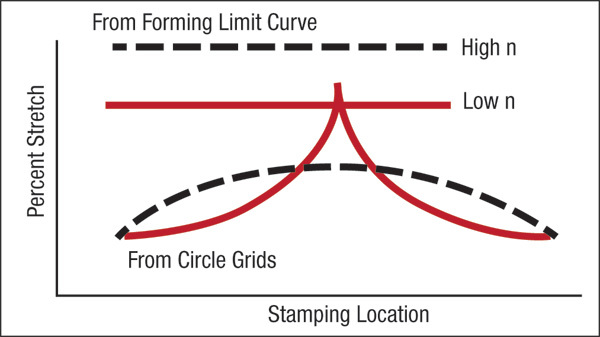 A structural engineer directed to reduce the weight of a load-bearing stamping will learn from his textbook that load capacity equals material strength multiplied by the cross-sectional area being loaded. Therefore, an increase in strength can compensate for the desired reduction in sheet thickness to provide a constant load-carrying capacity. Unfortunately, the formability engineer now faces several problems. For a specific type of steel, such as high-strength low-alloy (HSLA), an increase in strength reduces the work-hardening exponent (n-value—Fig. 1). In addition, specifying minimum yield strength establishes the maximum available n-value. The n-value controls several key aspects of metalforming, including maximum allowable stretch and growth of localized strain gradients. The onset of failure in sheetmetal stretching is a through-thickness or local neck that occurs just prior to fracture. The onset of this local neck terminates useful deformation throughout the stamping and is predicted by the forming-limit curve (FLC) for different combinations of surface strains. These maximum allowable strains decrease as n-value and material thickness decrease. While weight reduction by increased yield stress and reduced thickness structurally compensate each other, capacity for stretchability and bendability suffer a double reduction. In last month’s column we discussed the importance of higher n-values in preventing or at least restraining the growth of severe localized strain gradients. 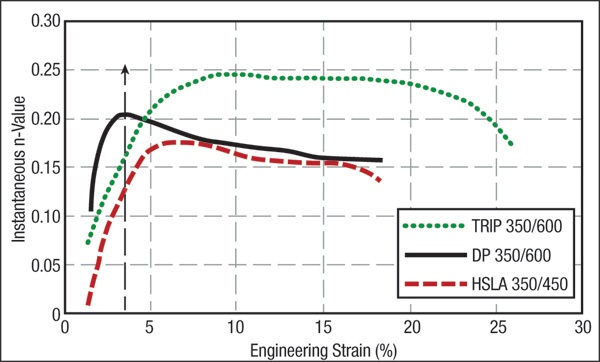 Localized severe strain gradients magnify the variation from process input variables, causing increased swings in elastic stresses and changes in stamping dimensions. Weight-reduction programs that increase yield strength and reduce sheetmetal thickness can generate these severe gradients. Fig. 2 summarizes the effects of lower n-values due to weight-reduction programs, with HSLA steel representing the low n-values and mild steel the high n-values. Fig. 2—Reducing n-value lowers maximum stretchability (FLC) and increases peak gradient strain in the stamping. • Steels with increased strength for the same formability. While both types are useful for weight-reduction programs, the first type is most commonly used and include dual-phase (DP) and transformation-induced plasticity (TRIP) steels. DP steels contain ferrite and about 10-percent by volume of martensite islands. While the ferrite base is very formable, the martensitic islands can have yield strengths of 200 ksi. Martensite interacting with the ferrite during the start of deformation creates higher n-values that minimize the growth of localized strain gradients. Fig. 3—At 3 percent strain, DP steels provide higher n-values to minimize growth of strain gradients. TRIP steels continuously generate even higher n-values to stop gradients from forming and provide increased maximum allowable stretch (FLC). Source: World-AutoSteel AHSS Application Guidelines. Fig. 3 shows instantaneous n-values for three steels having initial yield strengths of 50 ksi. At a strain of about 3 percent (vertical arrow), the n-values are 0.12 for HSLA and 0.20 for DP steels. The DP steel has the same n-value and initial stretchability as low-strength mild steel. 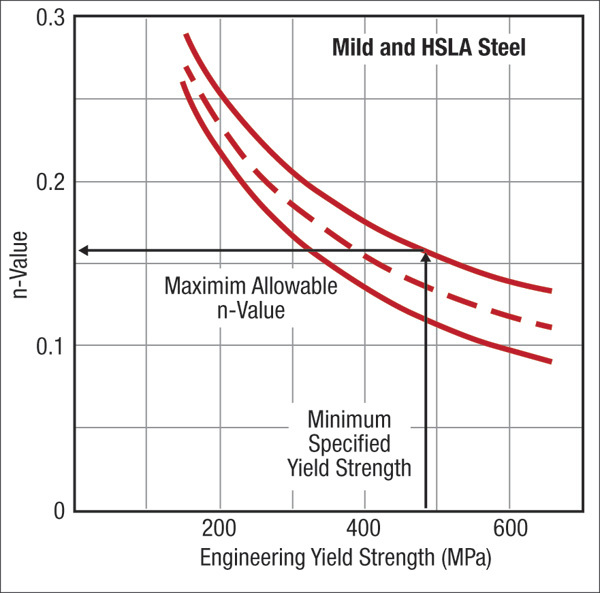 However, the higher n-values decrease to the value of the HSLA steel at around 8 percent strain. This indicates that the FLCs of DP and HSLA steels are equal. DP steel creates one initial event that generates a higher initial n-value over a limited amount of strain. In contrast, TRIP steels have a microstructure that constantly creates multiple events that generate even higher n-values over greater deformation (upper line in graph). The 0.25 n-value of the TRIP steel is comparable to the highly stretchable, low-strength vacuum-degassed interstitial-free (VD-IF) steels. Extending these high n-values to a greater deformation creates a higher FLC for TRIP steels. In Fig. 2, HSLA steel now represents the low n-value steel and the TRIP steels the high n-value steel.